If imitation is the sincerest form of flattery, then the North American province of Comhaltas Ceoltoiri Eireann should be very encouraged by the 60th anniversary celebration of the CCE Congress celebrated last weekend at the Tullamore Court Hotel. Taking a page out of the convening of organizational delegates in the U.S. and Canada in a suitable hotel since the mid-1980s that allowed a valuable social and cultural component to the yearly annual business meetings, so too did the annual Congress of CCE representing 415 branches in 15 countries. Taking the annual confab down the road to Tullamore, the site of three recent and very successful Fleadh Cheoil na hEireann festivals (2007-2009) rather than the smaller Head Office Culturlann in Monkstown, Dublin was an inspired choice that added to the festivities and a more relaxed approach to trumpeting its accomplishments over six decades. In the sea of negativity that defines Ireland’s economic plight, any positive spins are very welcome at the moment. Last weekend in Offaly conveyed that in every corner and panel from Friday to Sunday evening of the May bank holiday weekend, the traditional gathering of CCE Congress. In an effort to send a signal and support to the Irish countryside which has supported CCE from the branch up, taking the Congress to a public space and the additional spend that meant for Tullamore was just one nod of appreciation for the marvelous reception and boost CCE received from the running of the fleadh for three years prior to Cavan taking it on in 2010. In fact the growing importance of the annual All-Ireland musical competitions generally known as the Fleadh was an important ingredient all weekend manifest in many ways. When Ireland’s economic slide began several years ago the challenge of bidding for the opportunity to host over 200,000 people over the course of the preceding summer school called Scoil Eigse, and the weekend competitions in solo, duet, trio, grupai cheoils and ceili band categories obviously made it more difficult to raise the almost €100,000 euro sum for the rights for any town. When Cavan stepped to the fore two years ago as the only bidder prior to being granted a green light for August 2010, they were doing so as a calculated gamble that it would yield great tourism potential and much needed revenue for the region and its Cavan town base for the two year expected reign as the host for Fleadh Cheoil na hEireann ending in 2011. Raising the organizational bar, the Cavan county manager Jack Keyes was a co-chair of the organizing committee working with Cavan’s principal music event maestro, Martin Donohoe, and a large talented committee that also included a branding whiz in the Fleadh PRO Martin Gaffney. The gambit worked, and according to an independently produced Bord Failte study brought in €35 million euro and very positive survey results among visitors to the Fleadh with almost near-perfect satisfaction. So the corridors of the Tullamore Court Hotel not only had inviting displays for the two counties (Clare and Sligo) who have submitted applications already before the June 30 deadline, but were also abuzz with discussions about a third year for Cavan in 2012. Granting this would allow for an even more intriguing foray to Derry City in 2013, coinciding with its designation as the European Cultural Capital in an all-out campaign to solidify the All-Ireland approach to cultural and economic development . If the future Fleadhs augured the prospect of much needed economic stimulus, the completion of the CCE Development Plan yielding eight regional resource centers around Ireland thanks to a welcome investment of €25 million by the Irish government in the past five years has already decentralized and invigorated Comhaltas operations nationwide and abroad. CCE’s new Irish language initiatives are in lock-step with the Irish government’s 20-year strategy to bolster its native tongue. Adding icing to the cake at the 60th anniversary Celebration was the re-election of Senator Labhras O’Murchu last week against great odds to the cultural panel, giving validation to his strong leadership as director general of CCE and instrumental steward of government funding. 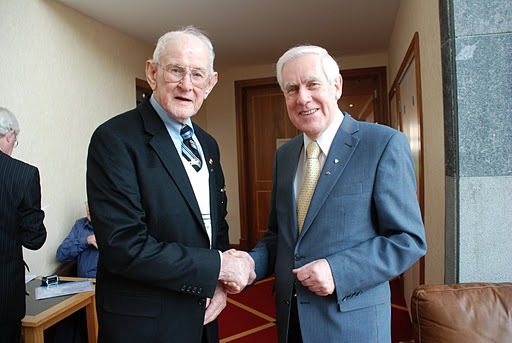 The founder of CCE North America, the 88-year old Bill McEvoy from Co. Laois was lionized all weekend long for his role in establishing CCE in North America and developing it over what will be 40 years in 2012. Still fairly fresh and in good form, he remains an iconic figure in Comhaltas lore reminding us how far the organization has grown at every opportunity.